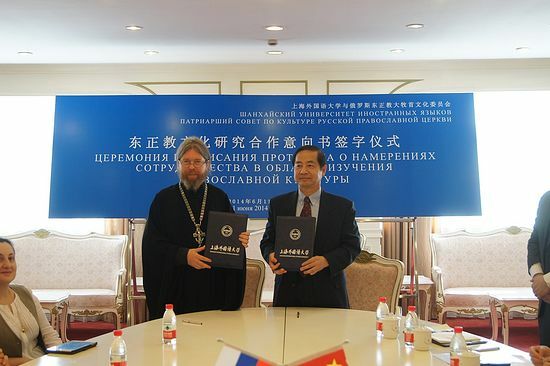 Moscow, June 16, Interfax - The Shanghai Foreign Languages University and the Patriarchal Council for Culture signed an agreement to set up a center for studying Orthodox culture at the university in Shanghai. The document was signed by the University rector professor Cao Demin and executive secretary of the Patriarchal Council for Culture Archimandrite Tikhon (Shevkunov), the Moscow Patriarchate website reports. The Center will help to get acquainted with traditional Russian culture, organize scientific work, publish books, especially the Chinese-Russian Bible vocabulary and Orthodox terms vocabulary, launch exchange programs for students and aspirants, carry out seminars and conferences, lectures for students and aspirants in China and in Russia. “There is a favorable tendency in activities of the Russian Orthodox Church in Russia. The Church plays more serious role in political, social, educational field as well as in Russia’s relation with close and far foreign countries,” Cao Demin said at the ceremony. Today, detailed acquaintance with Orthodox culture helps understand Russian realities and its culture better, “which will certainly have positive influence on Chinese-Russian relations and strengthening Chinese-Russian strategic cooperation in all spheres,” he said.